We’re two friends who met trekking in the Annapurna in 2012. We share a passion for trekking and believe it doesn’t get better than in the Nepal Himalaya – home to eight of the ten highest mountains in the world! In these blogs we share a bit more about Nepalorama from time to time. We love getting to know our clients and we want you to get to know us! When you trek, we want you to trek on YOUR terms and have the best possible experience! That’s why we’ve blended all the benefits of hiring an independent guide and booking with a premium trekking company! Krishna is one of the best and most experienced guides in Nepal and Anna is a super friendly and organised customer service expert. With our powers combined, we make the perfect team to organise your fully customised, authentic trip in Nepal! Read more about us here, and in the following blogs about Nepalorama. Interview with Buddhi – Professional Trekking Guide in Nepal! Interview with Ramesh – Our Friendly Nepal Trekking Guide! 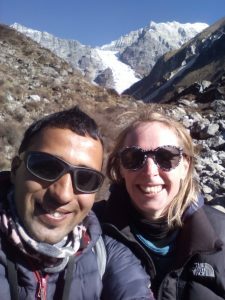 The third interview in our series of Nepal Trekking Guide Interviews is with our fun-loving, friendly Nepal trekking guide - Ramesh! Ramesh is Krishna's younger brother and he couldn't be happier to work in the family business. I met Ramesh for the first time when he was making sure a bus didn't leave without Krishna and I! His smile stood out among the crowd and I noticed the cheeky twinkle in his eye! Ramesh's clients love him and think he's kind, friendly and frank - trek with Ramesh and he'll openly share his experiences and opinions with you! How did you become a professional trekking guide in Nepal? "My family first saw my dream when I was 19 years old. You already know trekking runs in our family! My brother working as a trekking guide really impressed me. He told me important things about being a guide in Nepal and said we could get knowledge of lots of different places in the world. It was an easy decision to want to be a trekking guide, but it's hard work to actually become one. I started as a porter, like many others. After five years I became a porter guide, still carrying bags, but also having more responsibility and contact with clients. I worked really hard and learned lots of things. Last year I got my trekking guide license!" What do you like most about being a trekking guide? "I really want to support and help my family and I need to earn money to do that. It's important for me to contribute and now my brother Krishna has started a trekking business, it's great working with him. I think he is happy to work with me too! The heritage of the mountain region in Nepal is really interesting for me. Interview with Bibek – Trusted Nepal Trekking Guide! Interview with our Founder Krishna – THE Best Trekking Guide in Nepal! Elliot and his friends trekked with our Founder - Krishna in 2015. He wrote a great blog 'The Hardest Journey' about his experience that we want to share with you! You can read about their incredible adventure and get a taste for what it's like trekking Nepal here. 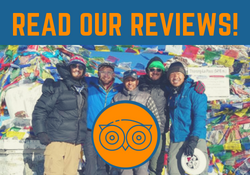 "Most of all, thanks to our superb guide Krishna Adhikari who made sure we never came close to dying, and managed to do so while laughing with a grin permanently fixed on his face. Furthermore, Krishna’s selection of comfortable lodging, filling meals, and fun activities allowed us to focus on moving one foot after the other and relish in the unparalleled landscape. I highly recommend you contact Krishna (Nepalorama Trekking) if you ever want to visit Nepal." Organise Your Trek with Nepalorama! Whether you want to embark upon your own 'hardest journey' or start with an easier, lower altitude trek, we can help! Take a look at our most popular destinations or get in touch for your customised quote! Still need some convincing? Here's why you should choose to trek with us!